With City failing in the Playoffs (yet again!) 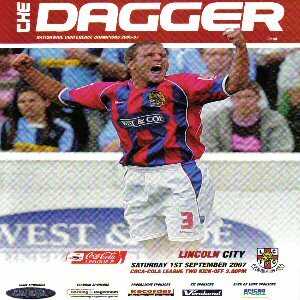 and Dagenham winning the Conference, it gave me a chance to add another ground to the list as I travelled to Essex to watch the Imps face the Daggers. Now, if you're travelling down and have read the instructions on car parking provided by all ground guide websites, ignore them. You're only allowed in the club's car park if your name is on the list, so you're stuck with street parking. Fortunately there are plenty of streets around the local area but all of them are extremely thin so I'd recommend getting there early to give yourself enough time to do a 27 point turn. After you walk past all the home fans you finally get to the away entrance, a huge metal gate that they keep closed until 10 minutes before they open the turnstiles. When you finally get in the ground you are met with some confusion if you have a ticket for the seating. Unless you ask someone you've got absolutely no chance of finding where the away seated section is. The view from this stand isn't bad but isn't particularly great either. You get a good view of the goal near you but you also struggle to see what's going on at the other end, thankfully the home fans near you seem quite friendly and didn't try and taunt the away fans once. The one saving grace I will give to the seated away end is the leg space, for quite a tall person I was reasonably comfortable, then again I did have my feet up on the seat in front of me. 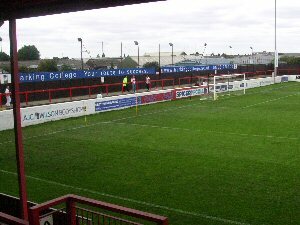 Unfortunately looking out at the rest of the ground you'd be forgiven for thinking you were at a Conference South game or something similar to that, the ground is severely non-League. 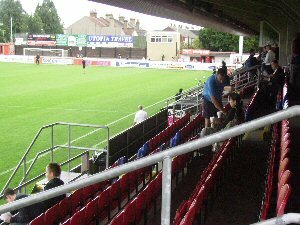 3 sides of the ground are a very small terrace, two ends of which don't have a roof and the final stand is easily the best of the lot, but even then it's a bit crap with only 5 rows of seating. 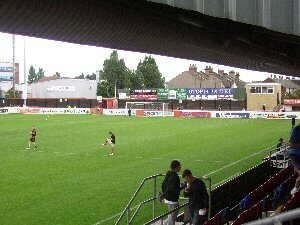 As for atmosphere, this is one of the weakest atmospheres that a team coming up from the non-league has produced. In my visit there was only one chant and that was amusingly "We Hate Boston More than You".....ok then. 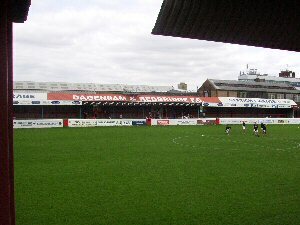 Overall I must admit I didn't overly enjoy my visit to Dagenham, infact it's one of the most miserable away days I've experienced and I can't say I'd be overly keen on going there again, but I know that I will end up doing if they and Lincoln are in the same division for years to come.